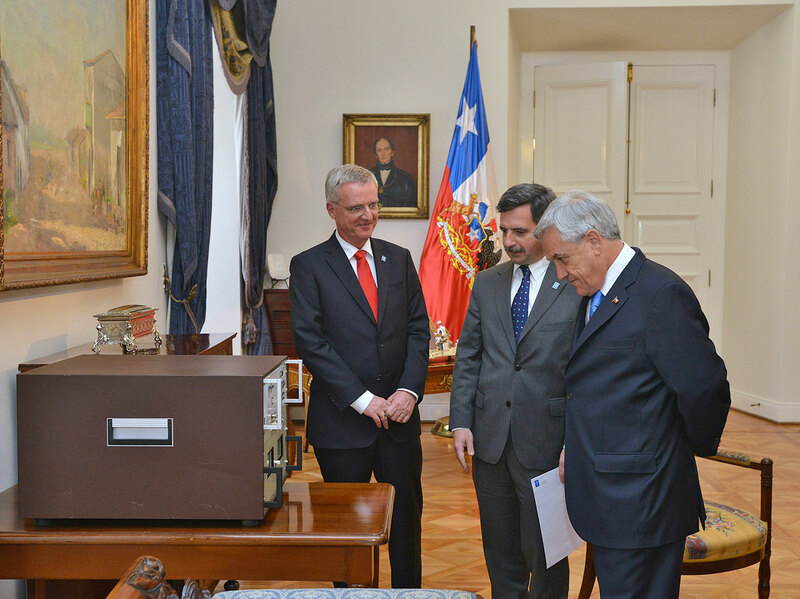 At a ceremony held yesterday at the La Moneda Palace, Sebastián Piñera, the President of Chile, received the first atomic clock used by ESO in Chile from Tim de Zeeuw, ESO Director General. This gift, a timepiece that was originally installed at ESO’s La Silla Observatory in 1975, was in gratitude for fifty years of successful collaboration between ESO and the host country. In return the President gave the Director General a fine volume describing the rich history of the La Moneda Palace. 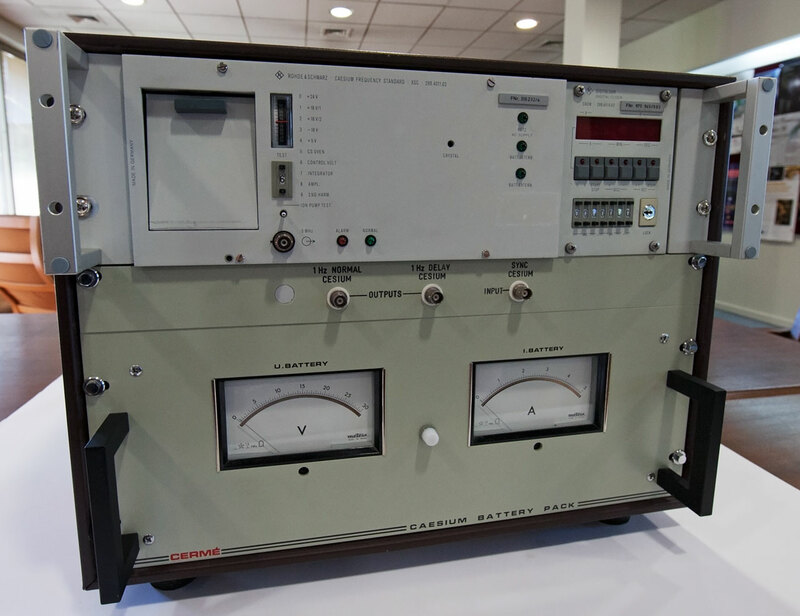 The Rohde & Schwarz atomic clock was the first of its kind in Chile and, for many years, the time signal of this clock was very important beyond La Silla. It served as an accurate time reference that was synchronised with the national source of time of Chile, located at the Cerro Calán Observatory in Santiago. 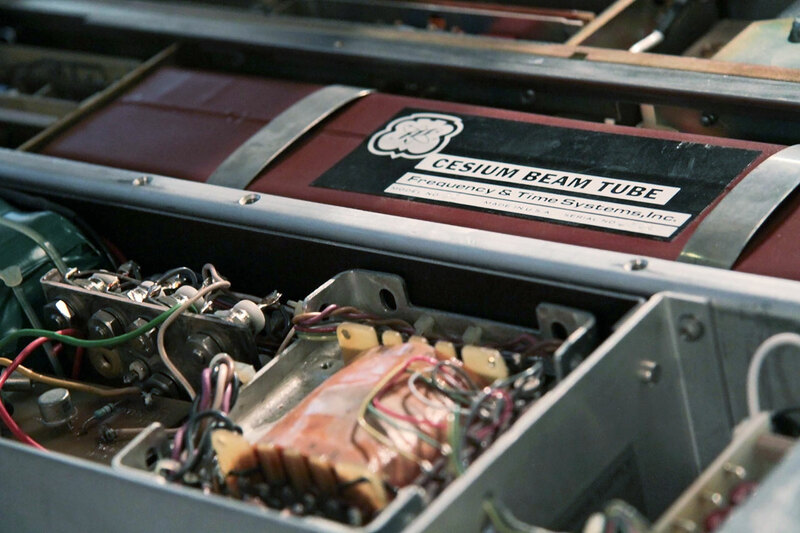 This was done by means of a “transporter of time”, that was physically carried from La Silla to Santiago to allow highly accurate synchronisation at regular intervals. Because of the strong bond that this atomic clock signifies, ESO decided to give the instrument to Chile, as one of the last 50th anniversary activities to celebrate the relationship between ESO and the host country of the ESO observatories. 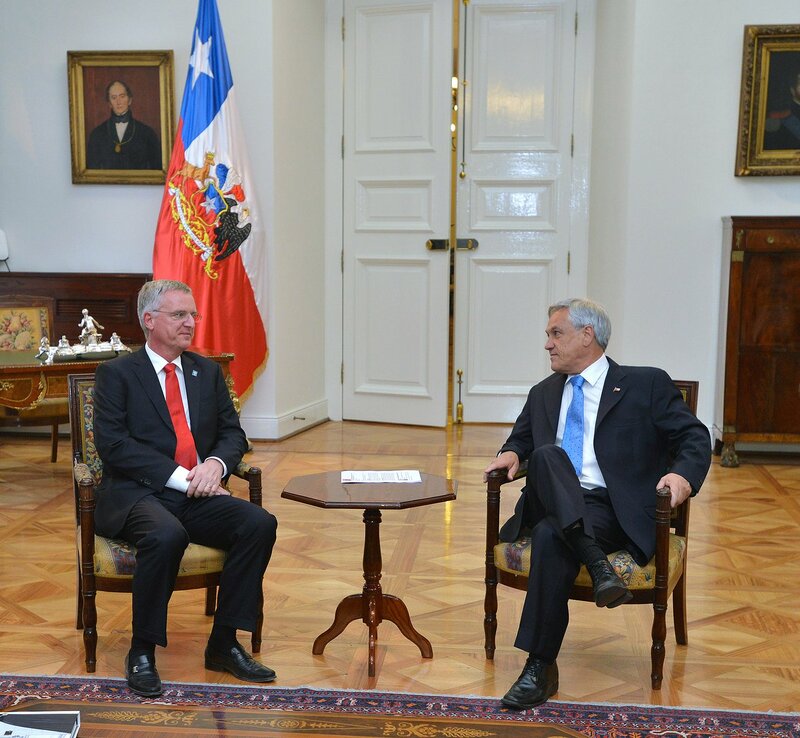 “For us, this is a very important symbol of gratitude for the collaboration established over 50 years with Chile. We expect that working together in the future will continue to bring great cultural, scientific and technological benefits for both the people of Chile and for ESO,” says Tim de Zeeuw, ESO’s Director General. 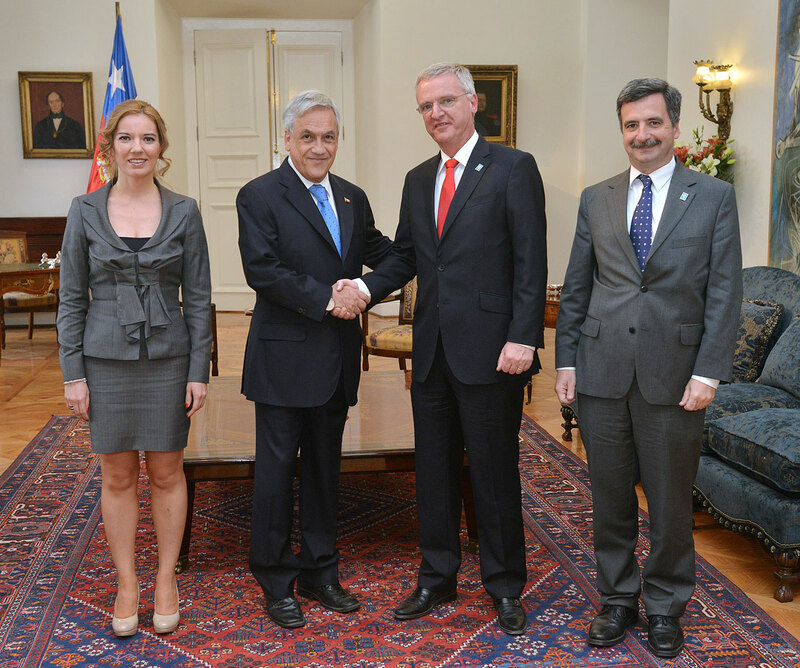 During the ceremony the ESO Director General, Tim de Zeeuw, was accompanied by the ESO Representative in Chile, Fernando Comerón, and Laura Comendador, ESO Head of Cabinet. 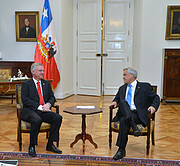 President Piñera was accompanied by the State Secretary of Foreign Affairs, Alfonso Silva, along with Gabriel Rodriguez from the Ministry of Foreign Affairs. The atomic clock contains caesium vapour in a resonant cavity that controls a reference frequency that can be used to keep time with extraordinary stability. For many years this clock provided the very accurate time needed to aim the telescopes and make them follow the daily path of celestial bodies across the sky. The time signal generated by the clock was then distributed to all the other telescopes at ESO’s La Silla Observatory, and also to digital displays in the telescopes and their control rooms, keeping an accuracy better than one millionth of a second.